Provides electric power transfer from the frame to the door in order to supply power to an electrified mortise or cylindrical lock, exit devices with electric latch retraction, and/or electric strikes (pairs of doors). Through-wire is rated 50 volts AC/DC at 3.5 amp continuous and 16 amp pulse. Maximum pulse 400 milliseconds. 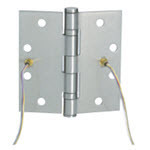 Ives through-wire hinges are fully compatible with 4 wire(TW4) and 8 wire (TW8) installations. Available CON option comes with the Allegion Connect 8-pin Connector which makes it easy to connect to other electrical consumption devices. We offer the entire line of Ives Door Hardware including Hinges, Pivots, and architectural finish products, Glynn-Johnson Overhead Stops & Holders and Schlage Hospital Push/Pull Latches. Standard Products ship within 10-12 business days. Common products ship in 2-3 business days. Otherwise, lead time is stated for each item.